We noticed this morning that Auria LE has appeared on the App Store, apparently with Audiobus compatibility. We strongly recommend that Auria LE only be used with Audiobus on the iPad 3 or 4. Unfortunately, Auria LE has not yet been registered with our database, which means until WaveMachine Labs do so, Auria LE won’t be able to be used with Audiobus. Switch back to Audiobus, then you will see Auria LE in the list. IMPORTANT: DO NOT LAUNCH AURIA LE FIRST. Its default buffer size is incompatible for use with Audiobus. 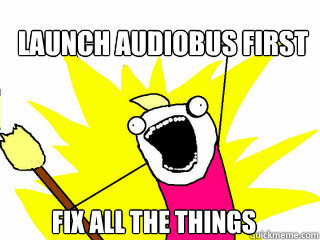 Launching Audiobus first avoids this problem. We have contacted WaveMachine Labs about this issue, and hope to have the situation resolved soon. We're waiting for both Auria and Auria LE to become available before we list it officially (Apple is still reviewing Auria). We hope this will be soon. We'll keep you posted! FYI, both Auria and Auria LE 1.06 have been approved, and are now available.